From the minute you and your pet enter our lobby, and are greeted by our friendly staff, we hope you feel comfortable and welcomed! We even have a side of our lobby just for our feline patients. We don't want any kitties to be scared by our canine customers! Our large, bright and cheerful exam rooms are designed to put you, and more importantly, your pet at ease! Atlantic Animal Hospital has it's very own surgery suite, complete with oxygen, heart rate, and blood pressure monitors. Our surgery table is even heated to make sure that all our surgery patients are kept as comfortable as possible. 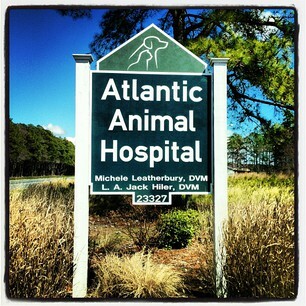 Atlantic Animal Hospital even has a small boarding facility that can accommodate 10 dogs and 11 cats. When your pet stays with us, we do recommend bringing his or her belongings and food for optimum comfort. But if your pet is a minimalist, we will gladly provide bowls, litter boxes, and thick, warm puff pads. We even have a bland diet, Purina Veterinary's diet EN, that we can feed if you don't bring your pet's food. For our canine guests, we have two fenced in yards where they can enjoy the sunshine! If you would like to tour our facility in person, you can do so anytime that we are open. 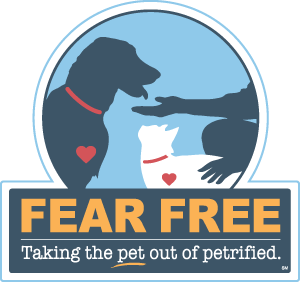 If you would like to schedule an appointment or boarding stay for your pet please contact us!